The Electronic Retailing Association is the trade association that represents many organizations involved in direct response marketing or “electronic retailing” on television, online on radio and in print. We have all flipped channels and seen direct response programs on television that cover everything from Ron Popeil’s “Pocket Fisherman” in the 1960’s to every conceivable kitchen or exercise tool that could be pitched by a celebrity or an energetic person with an exotic accent. On the radio we hear ads that present great deals so we have to scramble for a piece of paper and jot the number down while driving, and the internet is loaded with deals on software or any item that you could ever imagine purchasing. What most people don’t know is that real people are behind the success of products, promotions and pitchmen. And many leaders in the industry are members of the Electronic Retailing Association. Having first learned about the Wheelchair Foundation at his church, Danielson asked his friend Jan Fryer, who was raising funds to sponsor 100 wheelchairs, about the mission. What he learned led him to contact the Wheelchair Foundation and form an alliance. Over the course of the next few months, Danielson and his assistant Hannah Steffy contacted dozens if not hundreds of organizations and individuals to solicit participation in a well-rounded media campaign to raise funds for the Wheelchair Foundation. A long form 30-minute “documercial” for television was donated and produced by Take 2 Direct with actor Joe Mantegna donating his services as host for the program, several short form 60 and 120 second spots were created by Caudill & Associates and C Spot Run Productions, a radio campaign with numerous spots were produced and aired by Marketing Architects, the services of the call centers and credit card processing were donated by West Corporation, Live Ops and Transfirst, as was all of the creative effort that went into establishing the campaign. The spots on television were donated by Mercury Media, Euro RSCG 4D DRTV, Icon Media Direct and Cmedia, and tracked to produce the best possible results from a variety of national and international markets, but first the tapes of all the spots had to be produced by PMT and Tree House Media, who also paid for the Fed Ex shipping to each television station. The print end of the campaign included major articles by the Electronic Retailer Magazine, and an overwhelming commitment by John Bosacker of Novus Print Media. Novus placed ads, created by KR Direct, in dozens of local and national newspapers and magazines with an accumulative circulation of more than 10 million readers. But by far the most overwhelming statistic in this story is that the members themselves of the Electronic Retailing Association, its president, staff and associates have nearly all donated funds to sponsor wheelchairs. Mercury Media is matching any donation made by an employee, and the impact is incredible. All in all, the industry and its members donated well over $500,000 in cash and services in 2006. 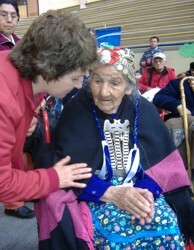 Gina Mullins-Cohen, Dan Danielson and Hannah Steffy join Sister Martina and an elderly wheelchair recipient in Villarrica, Chile. West Corporation and InPulse Response Group have donated an entire 280-wheelchair container to Vietnam, and this is added to the wheelchairs sponsored by the Direct Response industry so far to Chile (840), El Salvador (280), Israel (280), China (350), and South Africa (280). 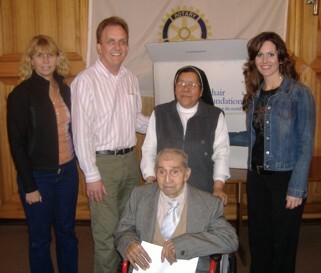 In October of 2006, Dan Danielson and Electronic Retailer magazine publisher Gina Mullins-Cohen joined a Wheelchair Foundation distribution trip to Southern Chile to witness the delivery of 560 brand-new wheelchairs, coordinated by Rudi Harwardt of the Rotary Club of Puerto Octay. 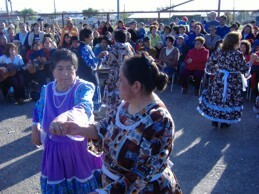 The image of Dan with a 29-year-old Mapuche Indian man named Cristian, appeared on the January 2007 cover of the Electronic Retailer magazine, with a story that told of their life changing experiences in Chile. The stories that Dan and Gina brought back to tell their association and industry has had a wonderful affect; ERA President & CEO Barbara Tulipane and their board of directors have voted to support the mission of the Wheelchair Foundation again for 2007, and wheelchair distributions are planned to coincide with ERA conferences in Hong Kong and South Africa in 2007. The Wheelchair Foundation wishes to thank the Direct Response Industry, the Electronic Retailing Association, its members, staff, associates and friends that have done so much to help us improve the quality of life for so many people around the world. “We are having an immediate and positive impact on these people’s lives.” – Dan Danielson, CEO Mercury Media. If you call right now, you can donate a wheelchair in the name of your loved one for only $75. Call toll free (877) 378-3839, right now! For a list of all Direct Response donors and participants, please visit the ERA Web site at: www.retailing.org. Christopher J. Lewis is the Director of the Wheelchair Foundation. 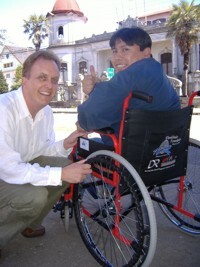 The foundation's Web site is at: http://www.wheelchairfoundation.org/ .